When you wake up unable to choose between making onigiri and california maki, you have to reach a reasonable compromise. 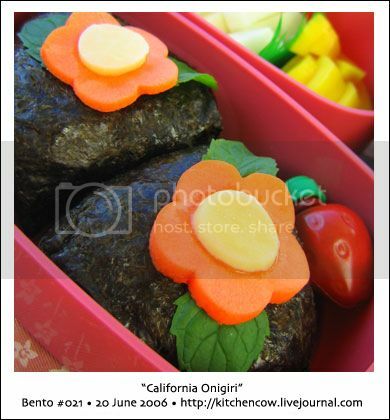 Like an onigiri with california maki fixings inside! A pair of onigiri stuffed with shredded kani surimi, sliced mangoes, and kewpie mayo, then wrapped with nori. To garnish, I placed carrot flowers with gouda cheese centers and mint leaves. For seasoning, I slipped in a pair of ichigo-shaped containers of soy sauce. Fruit & Veggie tray. Carrot sticks, jicama sticks, and mango slices. Can you say 5-a-day? 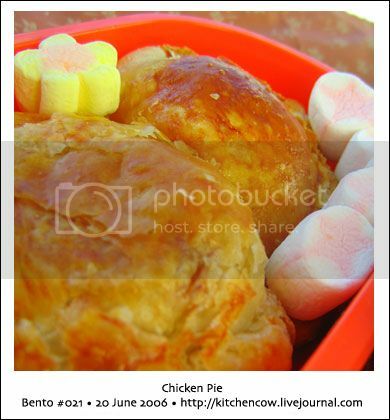 A pair of chicken pies from Conti’s (a really yummy deli-style bakeshop / resto), adorned with marshmallow stars & flower. And because my sakura i.kotoba bento’s finally making it’s debut, here’s the pic of it all together. I ended up buying another tier because a single layer wasn’t enough for my daily food needs. 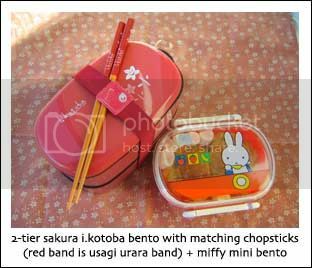 I bought the matching chopsticks and furoshiki, but since I couldn’t find the matching bad, I had to borrow the red band from my usagi urara set. 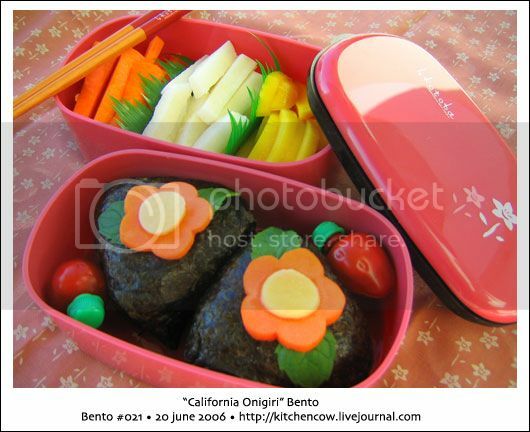 My Miffy bento’s feeling neglected lately so she sneaked in to get her picture taken too.